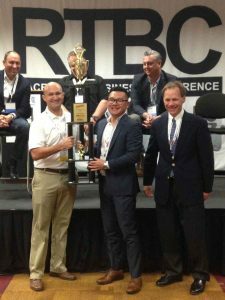 The Race Track Business Conference has awarded Jim Liaw, President of Formula Drift and Chip Pankow, President of Red Bull Global Rally Cross as “Innovators of the Year.” The third annual trophy was presented FuelTix at the Performance Racing Industry Trade Show. “Formula Drift and Red Bull Global Rally Cross are leaders in motorsports entertainment. 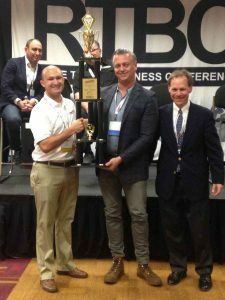 They are the most exciting events that are fan favorites,” said Dave Hutton – VP of FuelTix. “Formula Drift stakeholders work hard to present a compelling form of motorsports. Honored to receive this award,” said Jim Liaw – President – Formula Drift. “This is a special award for the entire RBGRC team. Thanks to our partners for making this series a success,” said Chip Pankow – President – Red Bull Global Rally Cross. Previous award winners were Jason Rittenberry and Dan Robinson. Formula Drift (www.formuald.com) is recognized as a North America’s professional drifting championship series. Taking competitive motorsports to the extreme, attracting fans and car enthusiasts from all walks of life. Red Bull Global Rally Cross (www.redbullglobalrallycross.com) combines the best aspects of circuit racing, off-road racing and rally competition to deliver intense action in fan friendly environments.